When you walk down any street in the city you are bound to spot at least one pizzeria with bright neon lights claiming to be home to the best slices in town. 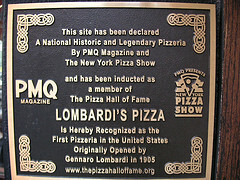 But there is only one place in the city, and in the nation that can stake claim to being the first, original pizzeria, and that is Lombardi’s. Opened in 1897 by Italian immigrant Gennaro Lombardi, who is known as the father of American pizza, Lombardi’s served citizens with delicious pizza long before it was one of the city’s trademark cultural icons. Over the past 100 years, Lombardi has transformed from a local grocery store, known mostly by workers looking for a compact but satisfying meal on their lunch break to a favorite eatery among locals, celebrities and tourists alike. The restaurant is notorious for its Napoletana styled pizza that spoils your taste buds so much you’ll never want to eat a non coal oven pizza again. Signature dishes on their menu include crispy crust and soft body pizzas with mouthwatering toppings like homemade meatballs and fresh wild mushrooms as well as their personal calzones, which promise to fill you up in an instant. 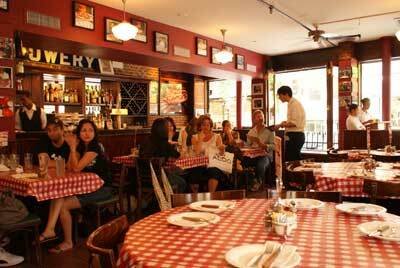 Aside from its coveted menu, Lombardi’s is also beloved for the dual atmosphere it has within its walls. The first has a more vintage ambiance which is comprised of an open kitchen and small booths that resemble what the pizzeria was like when it first opened. The second is a more modern and chic dining setting with proper tables and a more elegant air. After visiting Lombardi’s for the first time, you will quickly realize that there are many individuals competing for the title of Lombardi’s number one fan, and so I would advise that you be prepared to wait in line for a table. But even though Lombardi’s can get very crowded, very quickly, once you’re in you’ll almost forget your long wait as you’re immersed in a scrumptious slice of New York history. Lombardi is open Sunday through Thursday from 11:30 am to 11:00 pm and Friday and Saturday from 11:30 am to midnight.